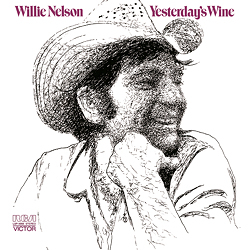 "Yesterday's Wine" - Willie Nelson (voc, g); Hargus "Pig" Robbins (org, p); Dave Kirby, Weldon Myrick (g); Bobby Thompson (bjo); Charlie McCoy (hca); Buddy Spicher (v); Roy M. "Junior" Husky (b); William Paul Ackerman (dr); a.o. ﻿Willie Nelson was down on his luck around 1970. No country idyll for him: with his wife gone, his ranch burned down, and his songs only ranking in the middle of the charts, Nelson withdrew from the world. He wrote a few new songs and combined them with several older, successful numbers to create the present concept album. "Yesterday's Wine" describes life's path from the cradle to the grave. Nelson questions human existence and what life is all about - without resorting to swift or loud tones. His picture of an 'Imperfect Man', which is partly a reflection of himself, remains peaceful and meditative throughout all the songs. Nelsons's music is equally as complex as the theme itself. As soon as the listener feels at home with the regular beat of the guitar chords and the floating waves of a steel guitar in this steady flow of familiar Tennessee sound, a metrical knock-knocking and a rough voice or an unexpected change of harmony interrupts the idyllic atmosphere. "Yesterday's Wine" expresses in sound crisis management, a psychogramme, and trust in God - all rolled into one. And yes - those who are looking for country hits will find their luck here as well.